The sea trials, which would include the firing of the submarine’s nuclear-tipped K-15 ballistic missiles early next year, would be a milestone in enhancing India’s strategic deterrence capability. The INS Arihant, India’s first nuclear powered ballistic submarine, which was under the Indian Navy’s Advanced Technology Vessel (ATV) project, with Russian help is ready for extensive sea trials. The submarine’s reactor attained criticality last August. The sea trials, which would include the firing of the submarine’s nuclear-tipped K-15 ballistic missiles early next year, would be a milestone in enhancing India’s strategic deterrence capability. 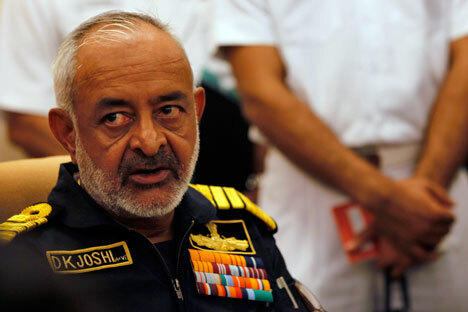 Indian Navy Chief Admiral D.K. Joshi said the INS Arihant’s nuclear reactor, which went critical on August 10 is currently undergoing a series of activities towards attaining 100 percent power at Vishakapatanam. This will be completed within the next few weeks and the nuclear submarine will go for sea trials. It has already completed harbour acceptance trials, Admiral Joshi said. The ATV programme was conceived in early 1970s in the aftermath of Indo-Pak war in 1971, when the US aircraft carrier USS Enterprise was deployed in the Bay of Bengal to intimidate India, following which the Soviet Union dispatched ships armed with nuclear missiles along with nuclear submarines to the Bay to ward off the American threat. The presence of a formidable Soviet nuclear fleet in the Bay of Bengal in support of India played an important role to neutralize American designs and bring an end to the war. Apparently, the then Indian Prime Minister Indira Gandhi believed to be quite impressed by the Soviet nuclear powered flotilla, ordered the ATV programme. Though the programme was conceived by Mrs Gandhi, all the subsequent prime ministers of India including Rajiv Gandhi, V.P. Singh, I.K. Gujral, Atal Bihari Vajpayee and the current Prime Minister Manmohan Singh have shown considerable interest in the success of the project. The nuclear submarine not only adds to India’s strategic deterrence capability, but also reflects the saga of the country’s strategic cooperation with Russia. Indeed, the Arihant’s design is based on the Russian Akula-1 class submarines and its 83mw pressurised water reactor has been built with significant Russian assistance. While its 100-member crew has been trained by Russian specialists, Indian scientists at Bhabha Atomic Research Centre have received significant expertise in reducing the size of the reactor to help it fit into the 10 m diameter hull of the nuclear submarine. In fact nuclear cooperation constitutes one of the strong pillars of Indo-Russian strategic partnership, sealed during Russian President Vladimir Putin’s first ever state visit to India in the year 2000. However, the strategic cooperation in this vital sector began much before the inking of the Delhi Declaration on Strategic Partnership. Russia is the only country that has been leasing nuclear submarines to India, reflecting the strategic nature the time-tested friendship. The first Russian Akula-1 class nuclear submarine, christened as the INS Chakra was leased to India by the former Soviet Union for three years in 1988. The second Russian nuclear submarine was delivered on lease to India in 2012 for a period of 10 years. Currently both countries are believed to be holding talks for renting another Russian nuclear submarine to India. The Arihant’s Indian crew has been receiving training on the second INS Chakra. Though India has land-based Agni missiles and fighters like Mirage-2000 to deliver nuclear war heads, its nuclear weapons triad would be completed only when the INS Arihant successfully completes its sea trials stretched over next 12 months. India has plans to build a few more indigenous nuclear submarines at Vadodara and Vishakapatanam However the Arihant is the technology demonstrator, as described by India’s former navy chief Admiral Nirmal Verma. Russia’s contribution to developing India’s nuclear capability is commendable. The presence of the then Russian ambassador to India Vyacheslav Trubnikov and other high ranking diplomats at the launching ceremony of Arihant in July 2009 confirmed the enormous Russian contribution to the success of India’s nuclear triad project. Arun Mohanty is Professor, School of International Studies, Jawaharlal Nehru University and director, Eurasian Foundation.